Why does Google still use paging instead of progressive loading? As a designer I believe "Page system" is less efficient than progressive loading inside a single page. However it is still widely used on many websites including Google’s search results. Maybe there is an important advantage of the pagination system that I am missing. Can you help me to figure out why it is still commonly used? Infinite scroll has its uses, but a search result page is not one of them. Infinite scroll relies on discovery and exploration. This works well for when you're not looking for anything in particular; when you're sifting through a massive amount of data until you find something that hooks your interest. This format lends itself extremely well for social media with newsfeeds, or inspiration platforms like Pinterest. You may measure the benefits of infinite scrolling with the example of a Facebook news feed. By unspoken agreement, users are aware that they won’t get to see everything on the feed, because the content is updated too frequently. With infinite scrolling, Facebook is doing it’s best to expose as much information as possible to the users and they are scanning and consuming this flow of information. Search results are all about finding what you need. Pagination is good when the user is searching for something in particular within the list of results, not just scanning and consuming the flow of information. Google wants to show you relevant data. Pagination tells you where the search results are located (page) and in which order they match your criteria. This helps to estimate how much time it’ll take to find what you're actually looking for and helps you find results back. Google has experimented in the past with loading times. Turns out, even with a slightly longer delay in loading, people are more likely to abandon the search. Infinite scroll is rather heavy on performance, so this would multiply this abandoning rate. There is no official statement regarding this, so no one can give you a 100% accurate answer. One of the biggest reasons might be the ad placement of Google. They earn money with every search, and since they use pagination they can even earn money multiple times with only one search, try it yourself. So in short, I think pagination fits Google's business goals. Maybe we should give up on the whole idea of a 'back' button. 'Show me that thing I was looking at a moment ago' might just be too complicated an idea for the modern web. Here is the Explain XKCD page for the comic strip. 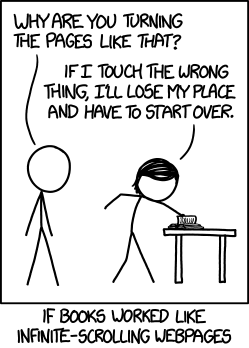 I just found the hidden comment above that already mentioned this XKCD comic strip. "If I touch the wrong thing, I'll lose my place and have to start over"
is when clicking a SERP entry, going to the destination URL and then clicking the Back button. This would usually return me to some other location than the previous SERP infinite scroll position where I left. Infinite scroll has the added downside of hiding the footer of the page unless its position is fixed to the screen. Because the resulting HTML isn't complete, some browsers display NOTHING, while others display what comes back. So, browser compatibility would be one reason. With infinite scroll, the only benefit for the end user is that they do not need page navigation to find what they want: everything's on the page, and simple CTRL-F can help them hone in on something. This trick does not work with pagination. Other than that, I don't see much benefit to infinite scroll. If you google "trump", Google will report "about 755,000,000" results were found. Of them, only 12 are displayed. The user's only requirement is, to keep asking for more. That list of 755M results is residing somewhere on some Google server, but is not downloaded to the user's browser. That's because pagination is used. With infinite scrolling, there are several implementations of it. Some is pseudo "infinite", where there are blocks (larger than a page; perhaps, 2 or 3 pages or more) which are privately downloaded and displayed a page at a time by the browser, and as the user scrolls down near the bottom of the block, another block is downloaded and displayed line by line or page by page. This gives the appearance that the list is infinite, and is a very common implementation. Which method is employed depends a lot on the type of data being served up. For Google, the potential to fling down 755M results means that managing that on the browser would cause a huge amount of network traffic to result, as well as crashing most browsers as the amount of data becomes unwieldy. But divvying up that 755M results is also unwieldy for Google, and is wasted effort since few people or systems will consume that much data. So Google more efficiently manages that data by privately storing only 128 of those results on its side, and divvys up that data into blocks of about 14 pages. The user sees 10 pages, but you can slide to the last page (page 10) and then see an additional 4 pages. You'll also note that the query has resulted in "Page 14 of about 128 results", not "Page 14 of 62,916,667 pages in .98 seconds"
Other forms of infinite scrolling don't involve that much data, but definitely more than a few pages: a news source, for example. US News and World Report today has 100 articles: it displays only 4 or 5, and in the background has downloaded about a dozen; you scroll down consuming that dozen, and when you get close to the last page of a dozen, another dozen or so is downloaded - all the appearance of infinite scrolling - this is the pseudo variant. There aren't 755M articles, but there are well over 100. When you get to 100, you can make a hard click to get more articles, and the process repeats: I gave up after making 10 "load more" clicks, suggesting there are well over a thousand results (indeed, the age of the articles are showing to be several months old; the implication is that the articles might go back as far as their repository contains). An example of true infinite scrolling serving up all results that pauses the browser as the last of the HTML is waiting to be received would be a client connecting to a site containing limited amounts of display data: an email client, an FTP client, or a music or photos page. There, the amount of items displayed might be expected to be no more than, say, a few hundred items, and so, that particular site might decide not to implement expensive libraries to manage the display. Other sites, like Flickr, for example, which does serve up images, has determined that many of its users have more then just a few hundred images, and so, they will implement a more robust pagination library. And therein lies the answer: performance vs functionality vs cost. If Flickr went on the cheap and decided not to implement fancy pagination, anyone using their site would walk away as their browsers crashed and burned as the wait time (or memory usage, or both) became too cumbersome. Question is, are you willing to implement an expensive pagination library (or roll your own) to keep your users happy? What is your ROI? How much time do you have? What features to you need to expose to the end user? What server resources do you have? Will your results result in even more data being displayed? As to that last question, here's a consideration: Google serves up only text. So you scroll and scroll, you see nothing but text. Suppose you served up images, like US News and World Report's news thumbnails, or Flickr's image thumbnails. Now your users are not only downloading the relatively small HTML representing an image, but, once downloaded, the browser has to independently download the actual image - that may come from another site like an advertisement. So the user's wait time to download data your server is serving up, but it also must further download user-friendly content. With infinite scrolling, that is a consideration for you: even background downloading of your data must necessarily include downloading content, which could be audio, photo, or video. Think about this: I know I saw that interesting results on Page2 is way better than "I have no idea where in this infinite page did I see this result". And Ctrl+F won't solve the issue if you have no idea what the result actually said. For example, if you search for white cat, you'll probably have hundreds of results on an infinite loading page, all of them for... white cat. How will ctrl+f help you identify the page you were looking for? This actually makes sense, because mobile surfing behaviors are quite different to desktop, and this kind of content loading arguably sticks better with the tendency to Progressive Web Apps (PWA) . Now, are these tests going to change the way Google did things up to date? We don't know. 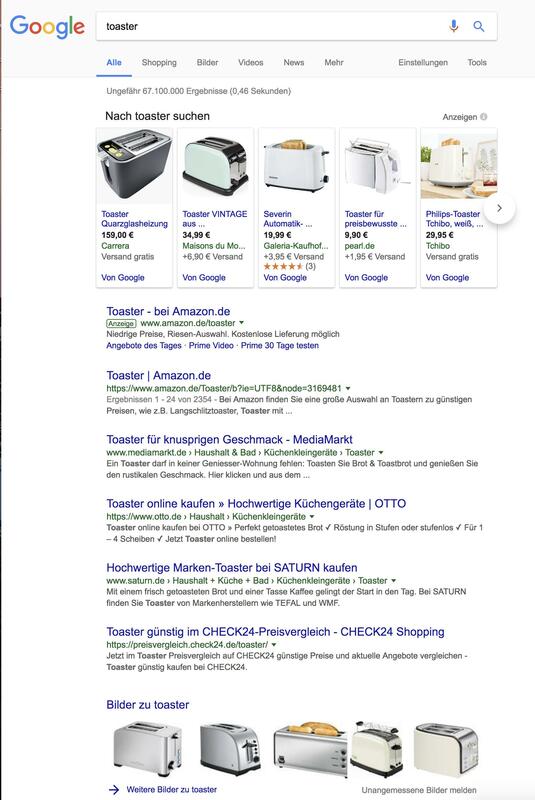 I don't think so, pagination on desktop is very valuable to Google, and we know they aren't big fans of changing their flagship product (Google search). For now, they're testing with this behavior on mobile, that's all we know. Google follows both models; pagination and progressive loading at the same time but for different pages. e.g. for images like here, you can see that there is progressive loading and after a certain moment, a CTA saying "Show more results" come which can show the other set of results but when you search in general like this then after a certain points, pagination option comes. The reason for this is when you do the image search, you are not looking for something particular and many results can solve your purpose of search but in the case of news and all results, you are looking for something particular and there are high chances that your required answer can arrive on the first page of results. You can find this quote here too. In general, an infinite scroll works well for something like Twitter where users consuming an endlessly flowing stream of data without looking for anything in particular, while pagination interface is good for search results pages where people are looking for a specific item and where the location of all the items the user has viewed matter. I think google does that so that it's easy to paginate & bookmark the search results if the user would like to, compare that to being lost in hundreds / thousands of lines of search results using progressive loading. Maybe..
Of all the websites I'm using daily, google search is surely the one that has visually and functionally changed the least throughout the years. They recently changed a few colors for the links I think and that was a pretty big thing for them. Any change there can potentially harm a billion users daily routines and muscle memory so it seems to me that Google is very conservative with displaying results on Google Search. 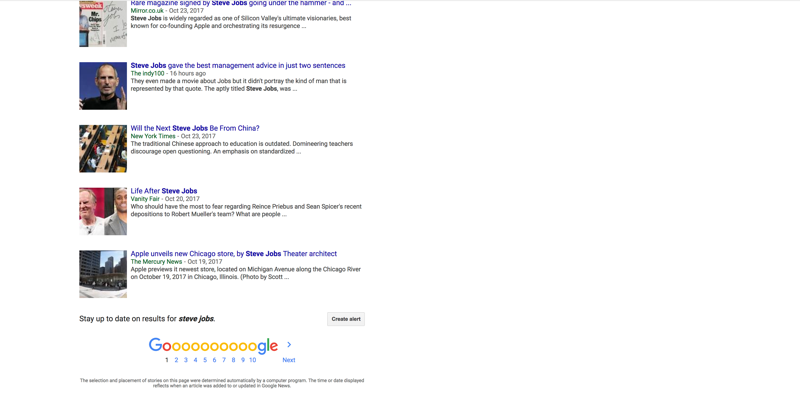 Google image search changed a few times, Google News has been refreshed rather newly. But they don't dare perform too big changes on Google Search. I think they would think many times before even changing to something beter so no wonder they won't change it to something worse. If you get to the bottom of the page you have to make a choice, either go to the next page or change your search criteria. With progressive loading these breakpoints don't exist and users will continue scrolling way longer. 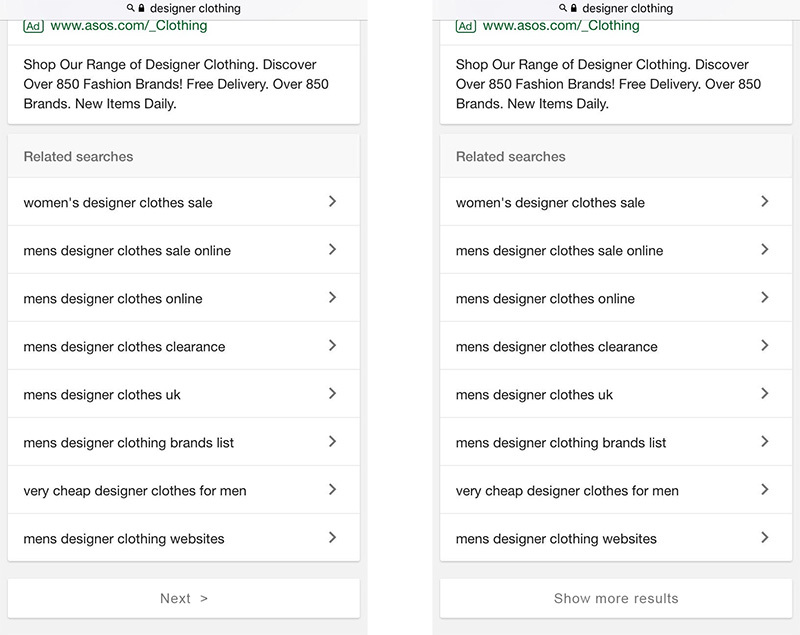 Having breakpoints allows you to abandon bad search keywords and try something else, helping you to find what you're looking for much faster. That is why search engines have pagination. It has nothing to do with technology. Computing search results isn't free. Asking the search engine for the first 10 results is much cheaper than asking for the first 100 or 1000. They certainly use a caching system: if they have seen your query 5 minutes ago, they don't hard-recompute the answer again, they give you the same answer they gave the last guy. Typically this is done by allocating that query to a specific server which handles all queries, say, in that MD5 range. The server then queries the search engine proper if this is uncached or if some heuristic indicates it is fast-changing. How large a query set is hard-computed: 10 results? 20? 100? A big factor is how much the caching system has the space to cache. Search results contain a lot of meta-data -- a LOT -- so the data is bigger than you think. Mind you, this is before the blending computations that localize your result. Some of the meta-data is for localization. This for sure: extending searches by down-scrolling means quite a few more people will be going deeper into search results than they now do... And that means significantly more computing overhead. Every feature-add can mean having to rack more servers to accommodate the load. However this one could mean quite a few more servers, with a considerable cost. Bricks and mortar may also get in the way: They may not even have the rack space. If you find the your answer in the last result of the page 1, then there is no need to go to page 2. In case of progressive loading as soon as you reach the bottom of the page i.e you are seeing last few results it will automatically load the data and increase the load on servers too. Alongside many of the things already mentioned, there are numerous Accessibility issues with infinite scroll. Cognitively there is the inability to search, not knowing where you are, or where to find previous content. As a user (and full-stack engineer) I am often annoyed by many of the single-page sites out there, and especially progressive loaders. These often scroll the page out from under me, or I loose track as things fade in and out. Or I still have to wait for the content to load, or end up looking at immensely long pages. More designers should opt for page-oriented designs, not the current fad of single page sites, if the pages are too long or slow. Forget it. 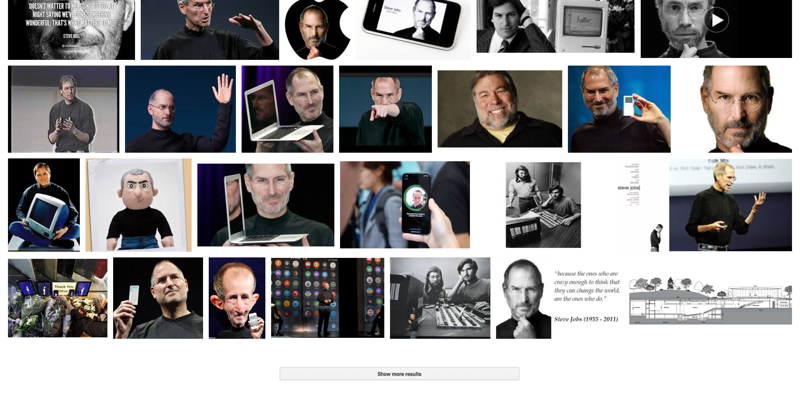 Even the 'page' I am looking at right now is getting close to what I'm talking about. Not the answer you're looking for? Browse other questions tagged pagination infinite-scroll or ask your own question. Why paginate/page break an infinitely scrolling dynamic list? Should I use 'Load More' or Automatic Loading? What are the primary reasons to use paging instead of a single page layout in a form? What is the purpose of slideshow web layouts and how can they be used effectively? Why not load all content at once but use infinite scrolling? 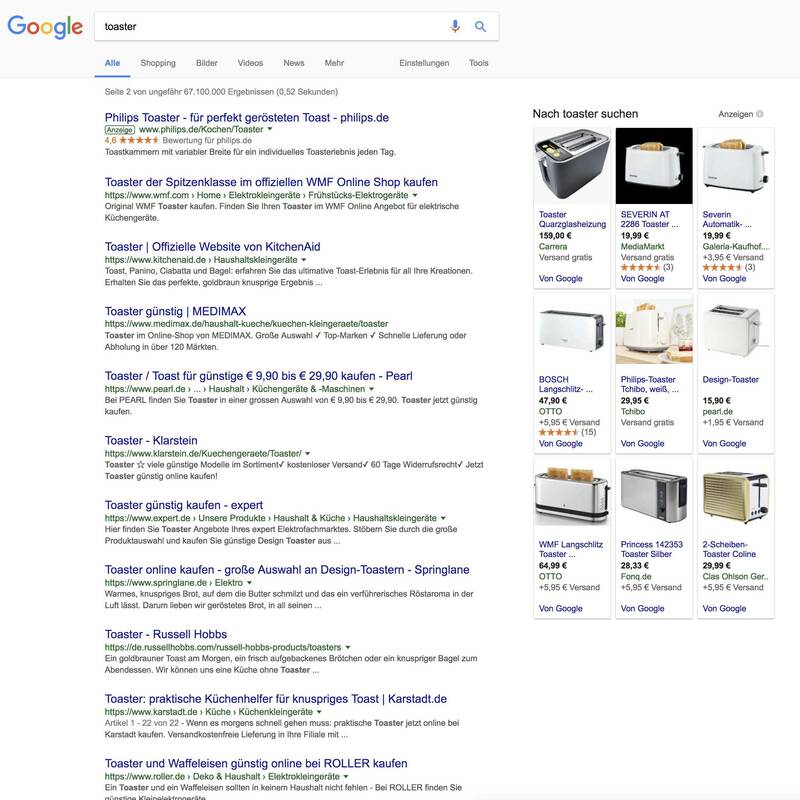 My client wants a “show all” option for search results. What to do?